Frazer Hines essays a dual role as both the Pat Troughton Doctor and his own Jamie McCrimmon alongside Anneke Wills as Polly and Elliot Chapman as Ben. The Doctor is dropping in on his old friend Meg Carvossa. The locale has changed radically, to a futuristic pre-fab landscape manned by eager to please service robots…and his friend is dead. But why does he get multiple analyses for the cause of death? What is the secret of this city of robots? Why is Jamie experiencing flashbacks to his highlander days…and dying over and over again? And is Carvossa really dead? Despite obvious parallels to the NSA and today’s frighteningly micromonitored surveillance state, author Simon Guerrier taps more specifically into a rather Asimovian paradigmatic dialectic. Frazer Hines continues to perfect his oft uncanny take on the Troughton Doctor, deftly shifting back into the youthful eubellience of his own Jamie McCrimmon without a hitch. Wills gets less airtime, but makes up for it with occasional descriptive narration, and Chapman offers a cracking take on Michael Craze’s decidedly cockney Ben Jackson. 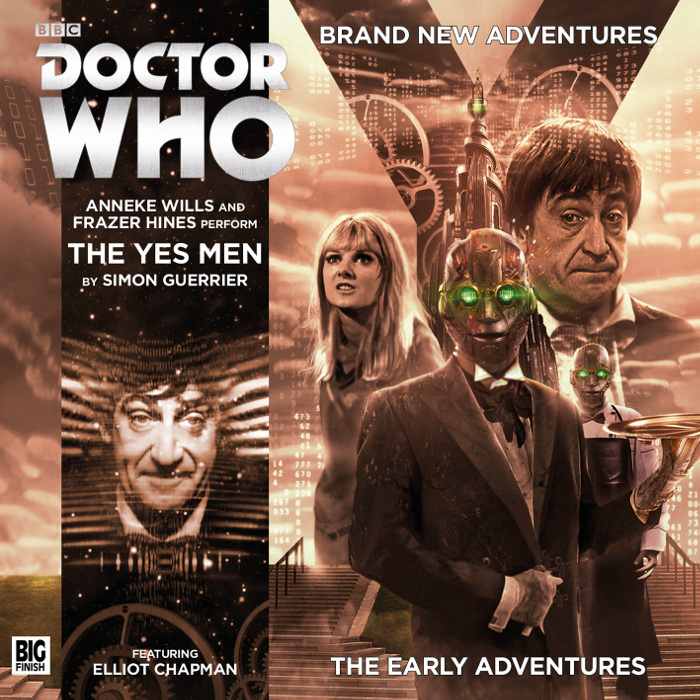 While the story is a tad uneventful by contemporary standards, it certainly feels true to the era of Who it’s intended to evoke, and Hines and Chapman certainly keep things lively with their earnest performances throughout.